Dr. Harris has three pets at home. Sticky is a 17 year old cat that has kidney disease and is on a prescription diet to prolong her life. Her two dogs were both “rescue” pups that needed homes. Cheyenne is 14 years old and loves to be outside to chase rabbits. Iris is a 7 year old mini-pit that has storm anxiety and is afraid of loud noises. All of Dr. Harris’ pets are microchipped, spayed, neutered, vaccinated and on monthly heartworm and flea/tick medication. Dr. Harris is active in her church choir and enjoys travelling and spending time with her family, both near and far. Dr. Grissom received her Doctor of Veterinary Medicine from Texas A & M. She practices relief veterinary services around Tarrant County and allows Dr. Harris the opportunity to take time off each month. In her spare time, Dr. Grissom enjoys bicycling and travelling with her husband. Jenni started at the Arlington Animal Hospital in 2014. Previously she had worked in I.T. systems support for document imaging systems. 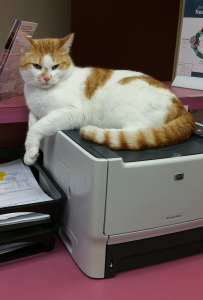 Jenni spends most of her time in the office, but enjoys the opportunity to take pictures of your pets for their medical records. Jenni’s goal is to keep everything running smoothly behind the scenes so that the rest of the staff can focus on your pets. Jenni and her children have three dogs. Sadie is a 10 year old boxer, Brody is a 3 year old collie mix and Boomer is a labrador retriever mix puppy that they just rescued. All of Jenni’s pets are “fixed”, microchipped, vaccinated and on flea/tick & heartworm preventatives. Jenni knows the importance of taking her pets for their annual wellness examinations and tests. Sadie has had cancer tumors removed twice and her quality of life has greatly improved! Veterinary Assistants are invaluable employees because they act as the doctor’s right hand and are a second set of eyes and ears. Vana has been with the Arlington Animal Hospital since 1988! She is a Certified Veterinary Assistant and invaluable asset to our team. Vana loves all animals and usually has a menagerie at home, including two cats, Shelby and Einstien. She also has Pearl the Pug, Aspen an Umbrella Cockatoo, a saltwater aquarium and even a pet squirrel named Mr. Grady. She rescued Mr. Grady as a baby when he fell out of a tree, and has cared for him ever since. Vana keeps all of her pets on monthly flea/tick & heartworm preventatives. She knows that living in Texas we have these parasites year-round. Vana is always happy to share her knowledge and advice on all animals including exotic pets. Tara has been a Certified Veterinary Assistant at Arlington Animal Hospital since 2011. She is currently in school studying to become a Registered Nurse. Tara has been able to apply a lot of what she has learned at Arlington Animal Hospital to her school work. Tara has a German Shepherd named Holley and two cats, Brodix and Miura. All of her pets are rescues and “fixed” to reduce the pet population and future health problems. Tara has to be very careful with Holley because she will eat or swallow anything. Once, Holley had to be seen by Dr. Harris for swallowing her own collar and leash! And another time for swallowing a cat toy. All of Tara’s pets are microchipped and on monthly flea/tick & heartworm prevention. Elizabeth came to the Arlington Animal Hospital in 2012 as a high school student needing career shadowing hours for her Certified Veterinary Assistant program. After graduation she became our part-time technician and kennel attendant. Elizabeth is currently working towards her Bachelors degree in Computer Science. Elizabeth has two small rescue dogs, Fynn & Osita. She has them both microchipped and current on their vaccinations and preventatives. Both dogs really love the OraVet dental chews sold here. They make great treats because they clean their teeth and give them fresh breath. Elizabeth also has four cute, fancy rats. Her rats are so spoiled! Whenever she has a salad, they get the scraps and they love carrots. Skyler is our newest part-time technician and kennel attendant, starting in 2017. She is working towards her Bachelors Degree in Biology. Skyler has a cat named Vader and dog named Obi-Wan. Gabriel is the Arlington Animal Hospital clinic cat that loves to greet the clients when they enter the hospital. But his favorite pastime is patrolling the hospital to make certain everyone is doing their jobs! Gabe enjoys daily naps and snacks!